At one of my last keynote presentations in Zurich last week, as soon as I popped this slide up, almost half the audience lifted their smartphone to snap a picture. For the past 2 months, I have been collecting a list of companies that offer services related to ICOs, and I’m sharing it today in the same sheet as the Ultimate List of ICO Resources that I published last March 2017. The list is in no particular order except that I’ve added the country of origin. That data point is almost insignificant when it comes to service delivery since the ICO process is global by nature. Nonetheless, it is interesting to note where these businesses are originating from. This list is updated from my presentation last week in Zurich, and now has 28 entries. The US leads with 10 entries, followed by Russia (5) and Switzerland (4). What types of services do these companies offer? Quite a variety. It is worthy to note that not a single provider offers all of these services, so you need to shop around and select what you need. Who are the brave companies that are providing these services? Here is the alphabetical list. 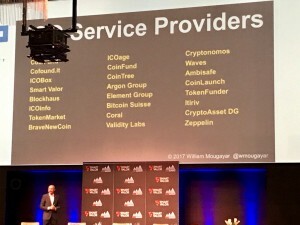 This list has been added to the original (openly shared) spreadsheet I created a few months ago, titled ICO Resources by William Mougayar. Feel free to make additions or add comments there. Yes, it’s a whole new world. Disclosure: I have formal relationships with Cofoundit and Coinlauncher, but didn’t highlight them in any peculiar way versus the other players.